Such is the perils of guerilla swatching, but I take what I can get! 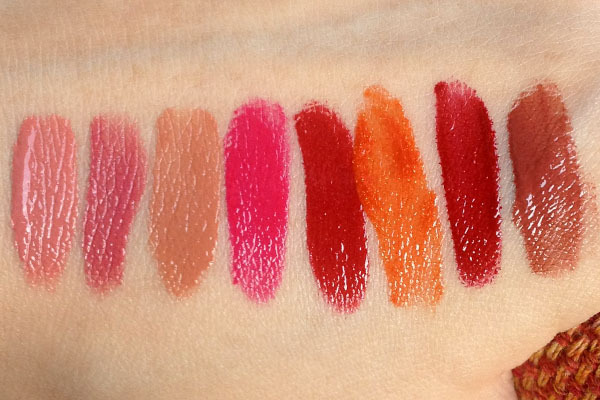 For a quick review (and better swatches), visit Ars Aromatica. I couldn't test it at the counter because the SA was absent and I didn't want to use the included wand. Desperate times call for desperate measures, so I finger-applied them to my lips. My initial impression is they feel very comfortable and moisturizing. From the way they swatched on the back of my hand, I am quite certain these could be sheered out easily if you want an alternative to full coverage. Shiseido Lacquer Rouges retail for $25 and is available at most major department stores and Sephora. The downside is they look tiny at 0.2oz, but that is the same size as a Chanel Rouge Allure Laque that used to go for $32, and those things take a long time to run out. PRETTTTYYY and Shiny!! I like ! For some reason I am drawn to Portrait! I need to look for these here! I really like the feel of these, but I was sad to discover that many of the shades have microglitter. Whyyyyyy? Disco is on my wishlist, such a fun bright shade! They look really lovely! Oh dear...these colors look amazing! especially the deep reds! I have Nymph and Drama, and love the feel of them both. I prefer them to the YSL ones. great colors! I have tried the new Shisedo lacquer but not liking it. Color is very intense but I didn't see any shades I really fall into. Thanks for the swatch. I played with a few testers that were (thankfully) new and I LOVE Portrait and Nymph! I was thisclose to walking away with both, but that was also the day I made the impromptu Kevyn Aucoin purchases so I backed out at the last minute...definitely going back for them though!! I have Nocturne and I love it; it's a great "Snow White" red and the formula is top-notch. I definitely want Nymph, and I'm debating Portrait. Between the two reds, which would you get? So lemming a liquid lipstick now! are these permanent or LE? I love "Nymph" and "Portrait"....these new lacquers look gorgeous!